Lisa and Michael decided that this property would be always known as Forevermore. A beautiful 80 acre property overlooking Pikes Peak that they would call their home forevermore. 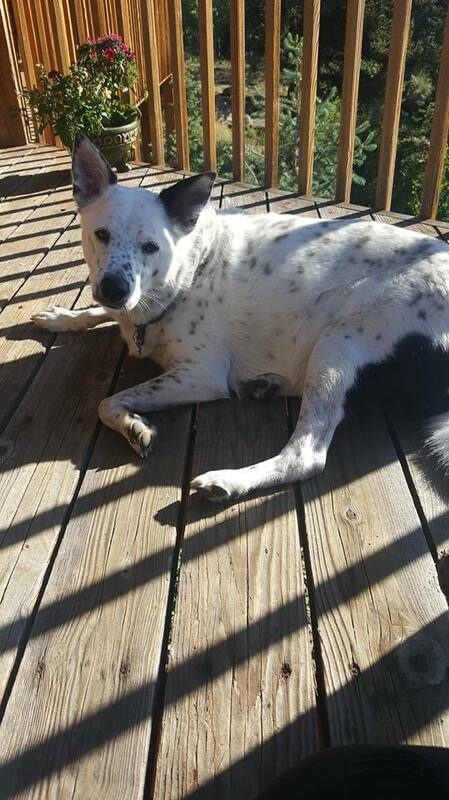 Aspen, an Aussie/Blue Heeler, welcomes their guests with love and happiness. The 3500 square foot cabin sleeps 10 additional guest comfortably in shared sleeping quarters. The land celebrates Aspen groves, red rock outcroppings, Ponderosa and Douglas Fir Pine forests and beautiful wild flower dancing meadows. Guests arrive either at Denver International Airport, approximately 2 hours away, or at Colorado Springs Airport which is about 1 hour away. Many times retreat guests will share the cost of a rental car. There are numerous beautiful locations to visit while here, if you are interested in extending your visit (speak to Lisa about extending your stay at the cabin if you wish); Pikes Peak National Forest, Garden of the Gods, Manitou Springs, and Colorado Wolf and Wildlife Sanctuary are all nearby. Lisa designs women's spirituality retreats of varying lengths and with diverse offerings, to help support her guests needs and desires. Additionally, the option for a personal one on one retreator a personal group retreat is always available. To learn about the upcoming retreat read below and contact Lisa if you are interested. If you wish to explore a private personal or group retreat reach out as well. (Arrive at cabin October 4th in late afternoon and depart on October 8 from the cabin by 11:00 am). $575 which includes a $100 non-refundable deposit. To Reserve your space you must register by 9/17/18. Lisa's famous and much loved Soul Fire Wild Woman Jubilation! In addition, each woman will also receive a one on one soul mentoring session with Lisa, to help explore and support the intentions and understanding found at the Retreat. This and much more will be a part of this powerful gathering of women along with tremendous honoring, celebration, witnessing and holding of sacred space. or click the email icon at the bottom of this page.